Saturday morning found me outside The Drum waiting with other people to see a show. A young woman came out of the dark doorway in a costume that would not have been out of place in Mad Max, to greet each member of the audience. She led us through mysterious clouds of smoke into The Drum, cleared of its familiar seating, to a strange dystopian landscape. A heavy perfume hung in the air and eerie music filled our ears. We sat in the shadows and watched the story unfold. To be precise we not only watched but also heard, felt, tasted and smelled the story unfold. A tale of disaster and abandonment, of survival and friendship and the need for a home. All of our senses as well as many of our emotions became part of the narrative, part of the landscape. Along with the characters we were covered in dust, thirsty in search of water and welcomed into their shelter – their HOME. The erstwhile audience shared the shelter and conversations, laughed at cleansing bubbles, listened to the songs. Then waited for the rescue message with hope, followed by frustration, they said five days, where were they? Fantastic theatre. I would have happily watched this production and loved it under any circumstances. The thing that made it especially memorable for me was the audience with whom I shared the experience. Frozen Light’s target audience for this show are young people with Profound and Multiple Learning Difficulties and their family, carers and friends. People for whom theatre can be tricky at best, at worst inaccessible or incomprehensible. Frozen Light, the company who created this magic, have not only produced wonderful theatre that has something for everyone to access but they have persuaded, amongst others, the Arts Council to fund it and Theatres up and down the country to invest in putting on what is essentially a loss making play. Every single member of the audience I was with loved something about the production. The lad next to me lit up every time there was music, especially the saxophone riff. A young woman loved feeling the water and another loved everything being able to follow the performance as it was also signed. The care and thought that went into every part was phenomenal yet there was no ‘dumbing down’ of the story. After the performance the cast of HOME, Amber, Lucy and Al took time out to talk to me about how they turn an idea into a production. I asked whether the multi-sensory aspect drove the plot or was inserted later. 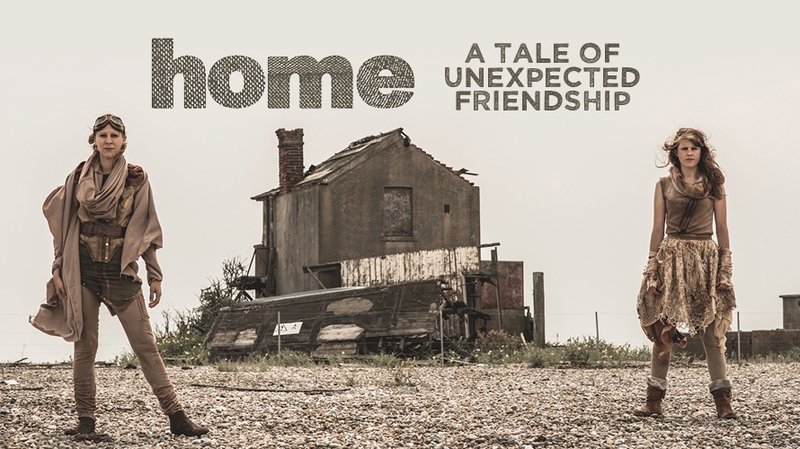 With HOME, the environment came first as an age appropriate setting inspired by sci-fi art and films. Then the sensory experiences and the story woven together, sometimes explaining the narrative, sometimes adding an extra layer. As the shows are interactions between the company and an unpredictable audience, they are adapted during performance to suit. Lucy said “The most important skill we have as performers is listening to what our audience needs from us in the moment” As for the thorny subject of funding, the company are now on their seventh Arts Council grant but still applying for each production as they create them. Long may it last and hoorah to the venues like the Theatre Royal Plymouth with the vision to stage these shows. Nowadays inclusion and accessible are buzz words, quite rightly our society seeks to enable rather than ‘disable’. If you want a masterclass in how to do this with sheer brilliance, go and watch Frozen Light next time they are nearby - everyone is welcome.